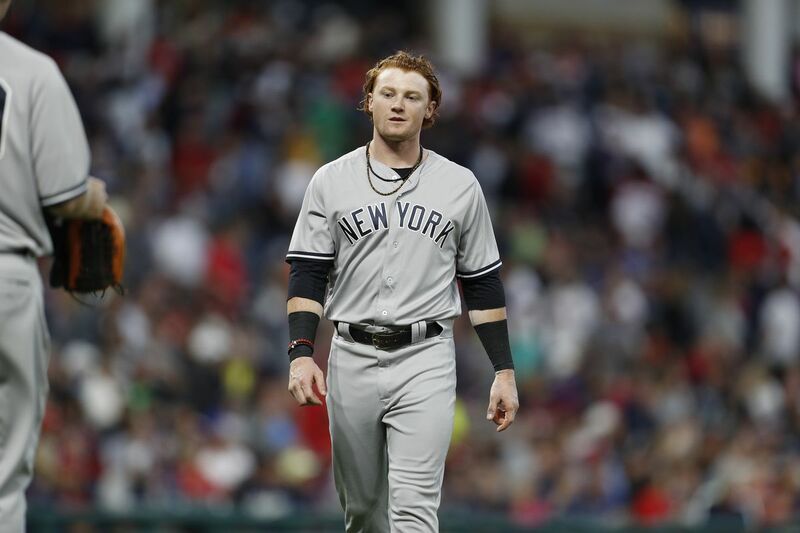 Much to the dismay of Yankees fans everywhere, Clint Frazier was optioned back to triple-A Scranton/Wilkes-Barre following Sunday’s win over Kansas City. Frazier made one start over the weekend, going 1-2 with two walks and a run scored. The 23-year-old outfielder is viewed as one of the last pieces of the baby bomber puzzle, and has already shown his sky-high potential. Frazier has done nothing but hit since returning from the concussion that sidelined him for nearly two months. In 15 games at the triple-A level, Frazier is hitting a robust .375 with four home runs and five RBI after going deep in his first game back with Scranton Monday night. On the surface, it seems like he has done more than enough to be with the Yankees permanently. However, one troubling development is his 15 to four strikeout to walk ratio. This falls in line with his career minor league ratio of 556 to 233 and the 43 to seven ratio he had with the Yanks last year. Frazier is an explosive hitter, but he has yet to show the type of power to compensate for that high of a strikeout rate, never hitting more than 16 home runs in a season. This is the last stage of his development, and something he can work on in Scranton. Another issue is the fact that the Yankees simply do not have any way to give Frazier every day at-bats at this time. New York has four outfielders that he would not play over consistently. Frazier could be used against lefties and to give the starters an occasional breather, but he would not see the field more than three to four times per week. For now, it is better for his development to play every day for Scranton/Wilkes-Barre and learn to become a more selective hitter. As for his role for the rest of the season, if a Yankee outfielder were to suffer an injury, Frazier would most likely be the one to take that spot. He is knocking on the door, and has shown that he can contribute at the Major League level, but he simply isn’t needed in the present. One can argue that Frazier would be a better option than Gardner and/or Hicks, but he doesn’t have the track record that either of those players do. For now, Frazier must continue proving himself. But what should the Yankees do with him long term? Well, as has already been discussed, Frazier’s raw talent is undeniable. He has also shown a knack for coming through in the clutch in his short time with the Yankees last season after coming through with a walk-off home run against the Brewers. This is a player that absolutely fits the bill as a solid every day left fielder with potential for more if he improves on his weaknesses. Additionally, the Yankees are going to need a left fielder next season unless they pick up Brett Gardner’s team option for the 2019 season. Some have suggested that Frazier could be used as a trade chip to land a starting pitcher either in July or next winter. He was reportedly part of trade talks between the Pirates and Yankees for Gerrit Cole last winter. However, it would be very risky to trade Frazier considering the state of the Yankees outfield moving forward. Gardner is aging, Aaron Hicks has not shown that he can stay healthy and Estevan Florial is still a few years away. 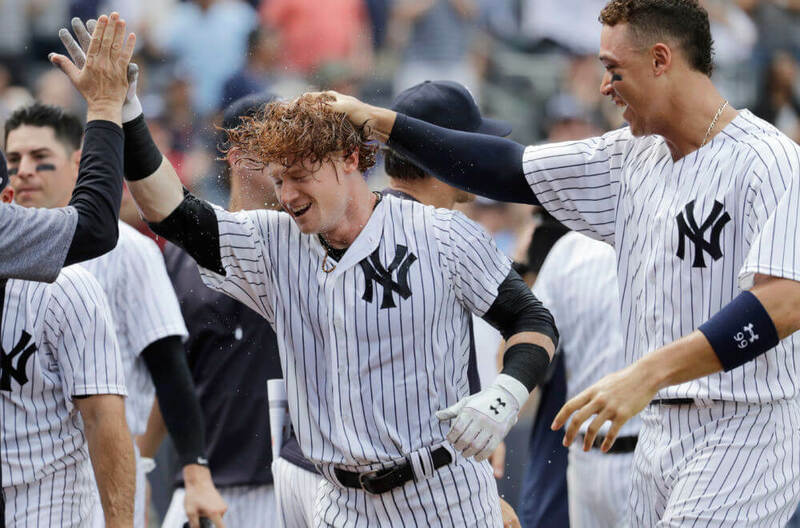 Moreover, the Yankees already dealt outfield prospects Dustin Fowler and Blake Rutherford last year, so their Minor League depth at the position has dwindled. If the Yankees do trade Frazier, it needs to be as part of a package for a stud starting pitcher that significantly improves the Yankees chances of winning it all this year. This is the only justifiable return for trading him. If they cannot find that type of offer, they need to hold onto “Red Thunder” and give him a chance to win the left field job next spring. It is not quite make-or-break time for Frazier with the Yankees yet, but we are getting there.